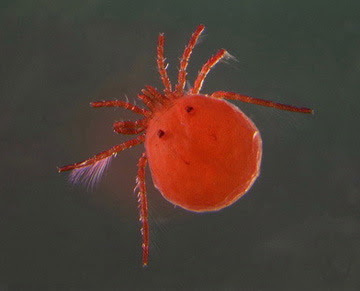 Hydrachna is a cosmopolitan genus of water mites found in temporary pools, ponds and lakes; larvae are parasitic on Hemiptera and Coleoptera (Walter et al. 2009). Characters (from Walter et al. 2009): Adult gnathosoma typically with long, curved, pointed rostrum. Palpi chelate, with dorsodistal tibial claw extending well beyond base of tarsus; genu longer than tibia. Chelicerae one-segmented and styletiform. Idiosoma with lateral eye capsules present and not borne on dorsal plate; body nearly spherical, variable in degree of sclerotisation, ranging from soft with dorsum bearing only glandularia platelets to heavily armoured with dorsum entirely covered by a dorsal shield. Genital field heart-shaped in males and rounded in females, with gonopore located posteriorly; bearing numerous genital acetabula borne on plates flanking gonopore; with conspicuous tubular ovipositor in females. Larvae aquatic. Gnathosoma lacking elaborate camerostome. Idiosoma with lateral eyes borne on dorsal plate; dorsum with large dorsal plate bearing eight pairs of setae, including verticils, scapulars, c3, and three additional pairs of hysterosomatic setae. Venter with coxal plates all separate; with paired urstigmata laterally between coxal plates I–II; coxal plates III located near midlength of body and laterally directed; excretory pore plate lacking setae. Leg with five movable segments, with basifemur and telofemur fused; tarsus with claws absent but empodium present. [D91] Davids, C. 1991. Water mites: the impact of larvae and adults on their host and prey populations. In: Dusbábek, F., & V. Bukva (eds) Modern Acarology: Proceedings of the VIII International Congress of Acarology, held in České Budĕjovice, Czechoslovakia, 6–11 August 1990 vol. 1 pp. 497–501. SPB Academic Publishing: The Hague.